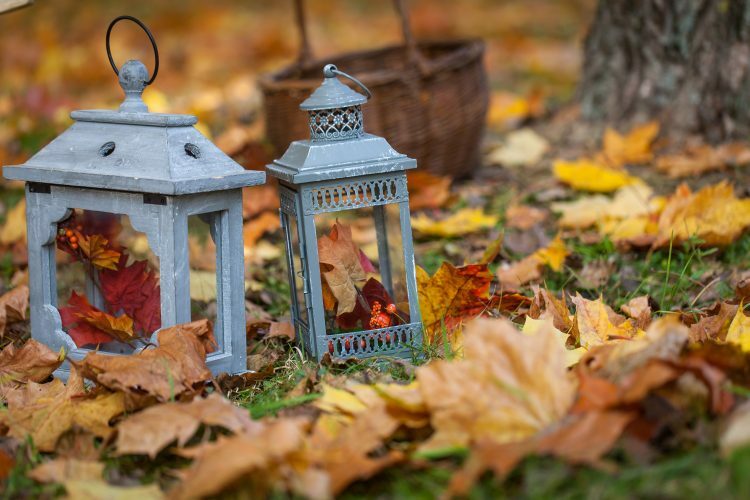 One great place to find some amazing fall decorating inspiration is no further than your backyard. Fresh fall foliage can be transformed into beautiful decorative accents for your home. Simple tree twigs can be adhered to a wreath form, along with fresh pinecones, silk flowers and ribbon to make a fantastic door decoration. Orange and red leaves inside a hurricane vase set on a side table are also a lovely way to decorate your house. If you have a garden and grew corn over the summer months, save your cornstalks to decorate the outside of your home for fall. You can tie dried corn stalks around fence posts and columns with some autumnal colored ribbon. Set up an outdoor vignette using the cornstalks, mums, fresh wildflowers and other items you can find around your home. Another great source of fall decor is in your kitchen pantry. You may have plenty of items on hand to help get your home ready for the cool, crisp fall season. Many pretty candle arrangements can be made from a hurricane vase, a pillar candle, and some form of grain found in your pantry. For instance, you can set a pillar candle inside a glass hurricane vase, then surround the bottom of the candle with popcorn or lentils. You can make another candle arrangement using a pillar candle and hurricane vase using items from your spice rack. Use star anise, whole cloves, and cinnamon sticks inside the hurricane vase, then set the pillar candle on top. Not only does this make an attractive fall accent piece, but it also smells incredible once the candle has been lit. You also can use cinnamon sticks glued to the outside of a pillar candle and tied with jute string if you do not have any hurricane vases on hand. Mason jars from your summer canning sessions are also a lovely accent to your fall decor. You can use them as votive holders, add them to vignettes around your home, place fall wildflowers in them or fill them with small pinecones and set them about your home. If you have not visited your local dollar store for fall decor, you are truly missing a great decorating opportunity. For one dollar each, you can find some beautiful items to help dress your home for autumn. Dollar stores have come a long way with regard to their offerings. They stock silk flowers, wired ribbon, tablecloths, napkins and rings, faux pumpkins and squash and just about anything you could need for your home. You can use these items independently or add them to the items you already have on hand to spruce up your home. Your local farmers market is a treasure trove for fall decor. You can purchase small and large pumpkins, gourds, dried ornamental corn, and even hay bales for decorating outside your home. While you are there, look for potted mums and other fall flowers to accent your home. Decorating for the fall season can be done on the smallest of budgets. Think creatively and come up with some ways you can incorporate a few autumnal touches to your home to get it ready for one of the best times of year. If you need some more money-saving tips to help you get your home ready for fall, or if you want to discover ways to earn points that can be redeemed for some great rewards, be sure to visit iRazoo to learn more.